The newly reconstructed Adjalala of King Glélé. Photo: Francesca Piqué. Of the many European travelers to the Kingdom of Dahomey in West Africa during the 19th century, explorer and writer Sir Richard Burton was one of the few to leave a detailed written record of his experience. In the 1860s Burton was sent by the British government to negotiate certain matters with King Glélé of Dahomey. From his account it is clear he was impressed with the Dahomey monarch's regal appearance and gracious demeanor. However, he also expressed frustration with the resistance of the king to diplomatic demands. Three bas-reliefs on the exterior walls of the Adjalala—or palace—of King Glélé; before their removal in 1988. Photo: Courtesy the Benin Department of Cultural Heritage. "The personal courtesies of the King," he later wrote, "compared badly with his stubborn resolve to ignore, even in the smallest matters, the wishes of Her Majesty's Government." King Glélé's assessment of Burton—according to Burton himself—was that he was "a good man, but too angry." Given Dahomey's history, the king's refusal to be submissive in the face of another nation's dictates should not have been surprising. Dahomey was a politically powerful kingdom in its own right. Following its founding in the early 17th century, it acquired a military prowess that made it one of the richest and most powerful nations in West Africa during the 18th and 19th centuries. A column of bas-relief replicas as they appear on the newly reconstructed Adjalala. Photo: Susan Middleton. This military might—based in part on companies of female warriors whose fierceness in battle equaled that of their male counterparts—enabled Dahomey to capture considerable numbers of prisoners of war. The kingdom's main source of wealth was the selling of these prisoners as slaves to Europeans eager for cheap labor to work the plantations and fields of the New World. Indeed, ending the traffic in slaves was one of the demands of the British. King Glélé's response to Burton was that the slave trade was an ancestral custom that had been established by the Europeans themselves, and he would continue to sell what the Europeans wanted. Some of Dahomey's wealth went into the construction of royal palaces. Almost from the kingdom's beginnings, its rulers built earthen palaces in its capital, Abomey, in the heart of what is now the Republic of Benin. According to tradition, King Dakodonou constructed the first palace in 1645, and thereafter each king had his palace built near that of his predecessors. The bas-reliefs constituted an integral decorative feature of the palaces, illustrating the Fon people's rich cultural heritage, complex mythology, customs, and system of rituals. In pictorial form, they recounted the battles fought and the tortures to which enemies were subjected, glorifying the victories and power of each king. Their function was to represent the significant events that marked the evolution and power of the Fon people and their kingdom. For a society without written documents, the bas-reliefs became an important and unique record of the past. "They are our only written history left," Benin historian Nondichao Bachalou has noted. "They are history told on our walls." The palace bas-reliefs also depicted mythical and actual animals that symbolized the characteristics of the kings and their power as rulers. One of the animals most associated with the reign of Glélé (1858-89) was the lion. When Glélé's Adjalala, or official palace, was constructed, the lion was featured in 15 of the building's 56 bas-reliefs. A century after his death, these bas-reliefs, which told the story of Glélé's achievements, have themselves become a story. Their conservation is presently the purpose of a special project being undertaken by the Getty Conservation Institute and the Republic of Benin. King Agoli-Agbo Dedjalagni of Abomey, surrounded by members of the royal entourage and the bas-relief conservation team. Photo: Susan Middleton. The Royal Palaces of Abomey, a UNESCO World Heritage Site, are composed of several earthen buildings covering an area approximately 44 hectares (190 acres) in Abomey. The entire site is still regularly used for traditional ritual activity and for ceremonies involving the royal family. Within the site is the Musée Historique d'Abomey, housed in the palace compounds of King Glélé and his father, King Guezo (1818-58). Problems for the palace site began at the close of the 19th century, when France claimed Dahomey as a protectorate and the kingdom's dominance in West African affairs came to an end. When French forces approached in 1892, King Behanzin ordered that the city of Abomey-including the palaces-be burned, with the intention of keeping it from falling into their hands. The French captured Abomey and made Behanzin's brother, Agoli-Agbo, the new king under the French colonial government. Under King Agoli-Agbo I's leadership, the royal palaces were restored around the beginning of this century. It is not clear how much of the palaces were destroyed in the fire and reconstructed early on, and there are many questions regarding the dates of origin of the surviving bas-reliefs. They may have been reproduced all or in part after French colonization. Early documents report that the royal compound at Abomey appeared as a vast camp of ruins. The Adjalala of King Gléléor the Salle des Bijoux (Hall of the Jewels) as the palace is now knownis listed among the buildings still visible. This suggests that of the surviving bas-reliefs, those from the Salle des Bijoux are possibly from an original group. Whatever their age, they are the oldest of the bas-reliefs that remain. In 1911 the French undertook their own effort to restore the palaces, particularly the compounds of Guezo and Glélé. Additional restorations took place between 1931 and 1933 and included the reconstruction of buildings and bas-reliefs and the replacement of traditional high-pitched, wide-eaved thatched roofs with low-pitched roofs of corrugated metal. These latter changes ultimately proved damaging to the palace bas-reliefs since, without the protection of the wide-eaved roofs, they suffered extensive erosion and decay. Following heavy rains that damaged the palaces in April 1977, the government of Benin contacted UNESCO for advice on conserving and restoring both the museum collections and the damaged structures. In 1977 and 1978 UNESCO provided conservation assessment, restoration plans, conservation equipment, and recommendations for long-term measures to safeguard the museum. 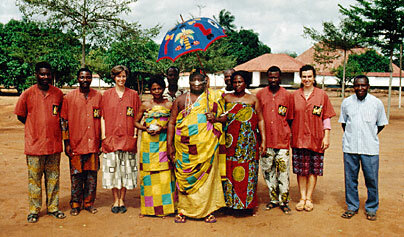 In the mid-1980s the Royal Palaces of Abomey were included as a cultural site in peril on the UNESCO World Heritage List. In 1988, at the suggestion of a German architect working in Benin, the Salle des Bijoux bas-reliefs were detached from their facade prior to the building's reconstruction. Because these were the last bas-reliefs thought to be originals, they were the only ones saved in the reconstruction of different palace buildings in the museum compound. After they were removed, the Salle des Bijoux bas-reliefs were remounted as individual panels in heavy casings of stabilized earth (local earth plus 8%-10% cement). Since their detachment, they have been moved several times between different storage areas in the museum. In 1991 a delegation from the GCI—including Director Miguel Angel Corzo, then—Special Projects Director Neville Agnew, Training Program Director Marta de la Torre, and Julian Zugazagoitia, a GCI consultant—visited several sites in West Africa to familiarize themselves with conservation needs in the region. During the delegation's visit to the Royal Palaces of Abomey, the Benin Ministry of Culture and Communications requested assistance in conserving the deteriorated bas-reliefs. Because of its interest in African cultural heritage and its expertise in conservation of earthen materials, the Institute agreed to collaborate with the Department of Cultural Heritage—part of the Ministry of Culture and Communications—on a project to document the bas-reliefs, study the causes of their deterioration, conserve them, and provide training to selected local staff. "We wanted to maintain authentic elements on the site upon which we could build archives," explains Rachida de Souza, Director of the Department of Cultural Heritage. "With that idea in mind we knocked on many doors. The Getty Conservation Institute responded favorably to our appeal, encouraged us, and helped us undertake a unified program of research, documentation, training, and conservation." Once the bas-reliefs are conserved, she says, they will form an integral part of the museum's collections. Of the 56 bas-reliefs originally on the walls of the Salle des Bijoux, 50 were located. Unfortunately, their detachment had fundamentally changed them. No longer an ensemble of architectural elements with a story to tell, the bas-reliefs were now separate artifacts—a fact that diminished their significance as a set of symbols recounting the feats of Glélé and his power as king. The storage space at the Musée Historique d'Abomey where the bas-reliefs have been housed. Photo: Leslie Rainer. Transporting a 300 kilogram bas-relief to the atelier for conservation treatment. Photo: Susan Middleton. The badly damaged back of one of the bas-reliefs prior to treatment. Photo: Susan Middleton. The same bas-relief, treated with Japanese paper and surrounded by cotton, during preliminary treatment. Photo: Susan Middleton. For most of the panels, the depth and proportions of the niches had been modified by the cement casings, so that their original appearance had changed. Moreover, many of the bas-reliefs were severely damaged. One bas-relief had fallen and was in pieces face down in an outdoor storage area. Previous restorations and repairs were evident, and many areas exhibited differences in level, color, and surface texture. Additionally, several superimposed paint layers could be identified, at times revealing an entirely different polychromy in the different layers. The collaborative project to conserve the bas-reliefs was officially launched in autumn 1993 with the first conservation campaign. Since then, work has been carried out during spring and fall field campaigns, supported by research, preparation, and study in between. During the campaigns the bas-reliefs—each weighing up to 300 kilograms, or over 650 pounds (about as heavy as a large refrigerator)—must be moved from their storage area into the atelier for treatment, then back into storage following conservation, to await their ultimate public display. Local resources are being used for the manufacture of customized iron easels, storage for the bas-reliefs, and a system of transport, which includes a custom-designed pushcart, a dolly, and a pulley system for moving the artworks. The conservation is limited to the stabilization of the bas-relief panels. Prior to transportation, the fragile paint layers of each bas-relief are temporarily protected with a facing of Japanese paper applied with water over the painted surface. 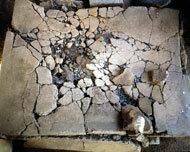 Unsightly old repairs that show a difference in level, color, or texture are removed or leveled. Further conservation treatment includes the filling of cracks and voids. For this procedure, local earth matching that in the originals is used. Delaminated paint layers are reattached with a very dilute acrylic emulsion adhesive. Finally, with cotton swabs and water, the surfaces are cleaned of the drips and accumulation of red earth. Inpainting is limited to background areas, so that the traces of damage and of wear—evidence of the bas-reliefs' history and age—are left exposed. One of the main objectives of the project is to train selected Department of Cultural Heritage staff members in the planning and practical aspects of the conservation program. Training covers project development and organization; documentation and technical examination; theory and practice of conservation; and storage, exhibition, and long-term maintenance of the bas-reliefs. Mme de Souza believes that the knowledge gained through the project by her department's staff will have a long-term impact. "Some of the staff will remain on the site to assure continuing preventive conservation of the bas-reliefs. Others will return to their respective museums, but will be a continuing resource for the Abomey site. At the same time, they will also pass on and continue to use their acquired knowledge at other sites where there are similar problems of conservation and restoration." Documentation is another significant aspect of the project. It includes historic research on the bas-reliefs to assist in understanding their evolution and the causes of their deterioration over time. The project team is also preparing written, graphic, and photographic documentation of the conservation itself. In addition, the GCI is producing a one-hour documentary for the general public on the conservation and cultural significance of the royal bas-reliefs. The conservation team at work in the atelier. Photo: Susan Middleton. A long-term maintenance and monitoring program is now being designed and implemented for the conserved bas-reliefs, and an exhibit featuring them will ultimately be installed at the Musée Historique d'Abomey. Since their detachment from the Salle des Bijoux facade in 1988, the building has been reconstructed, and copies of the original bas-reliefs now adorn it. While it would have been appropriate to reinstall the bas-reliefs in their original positions on the facade of the Salle des Bijoux, it is perhaps preferable to exhibit them in an interior setting where they will be more protected. Not only does the Salle des Bijoux house part of the museum's collection, it is also an integral part of a palace grounds and continues to serve as the site of royal rituals and events. Because of the site's ceremonial importance, the present king, Agoli-Agbo Dedjalagni, and the royal family are consulted on its conservation, management, and development. The king and his ministers have met several times with the team conserving the bas-reliefs, and the king himself has shown his interest in the project by making an official visit to the conservation atelier and the residence of the GCI team in Abomey. Afterward he stated that this visit was an expression of the royal family's appreciation for the work being done. The king's prime minister, Damien Agoli-Agbo, told the team that his visit to the conservation atelier had changed his conception of what preservation meant with regard to the bas-reliefs. He now recognized that rather than restoring the bas-reliefs to their original state, the project was preserving their history. The bas-reliefs, both those being conserved and those still being made, reflect a culture that integrates living tradition with the objects and sites of its past. The conservation of the palace bas-reliefs is part of a larger effort to preserve this living culture, craft, history, and national identity. The palace buildings, the museum's collection of objects, and the bas-reliefs are important not simply for the past they represent but also for the tradition they help maintain. Because of its continued ceremonial use, the Musée Historique d'Abomey is not solely a museum in the traditional sense. "Our colleagues," says Mme de Souza, "tell us that this is not a museum, since the objects, though they are museum pieces in the sense that they are inventoried, continue to be used. The site also is functional." The ceremonies and rituals observed on the palace grounds are part of what she calls the nation's "nonmaterial" culture. "We believe that this site lives through the complementary existence of its material culture—its buildings, its objects, its bas-reliefs—and its nonmaterial culture, which is its most important dimension." A royal bas-relief after conservation treatment. 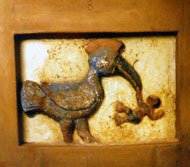 It depicts a hornbill, one of King Glélé's symbols of power. Photo: Susan Middleton. For the GCI as well, the Abomey project is more than the conservation of a set of unique objects. It is the preservation of culture—and, as Neville Agnew, the Institute's Associate Director for Programs, expresses it, "the cultivating of a growing consciousness in Benin regarding the importance of conservation." It is an appropriate image given the meaning of King Glélé's name—"cultivated field"—derived from the traditional saying "The cultivated field is difficult to move." For Glélé, the name was meant to convey the firm roots of his power. Perhaps in the future it will come to stand for the enduring quality of the culture he represented. Francesca Piqué is a Special Projects Research Fellow at the GCI. Leslie Rainer is a Special Projects Senior Fellow. Together they lead the GCI's team on the Abomey project. Benin Government Officials: King Agoli-Agbo Dedjalagni, Damien Agoli-Agbo, Jean Akohouendo, Rachida Ayari de Souza, Marius Francisco, M. Toussaint Godonou, Félicienne Guinikoukou, Paulin J. Hountondji, Mathias Labintan, Pierre Metinhoué, Gabriel Orou Bagou, Denise Sossouhounto, and the staffs of the Historic Museum of Abomey and the Ministry of Culture and Communications. Conservation: Christophe Agbachi, Neville Agnew, Léonard Ahonon, Justin Alaro, Guillermo Aldana, Désiré Awoui, Pascal Ayoyito, Mitchell Bishop, Jules Bocco, Michèle Buchholz, Pedro Pablo Celedón, Martha Demas, Denis Dohou, Pia Dominguez, Valerie Dorge, Aimé Gonçalvez, Michel Hebrard, Benoît Houinato, Janvier Hounlonon, Gilbert Kinkin, Molly Lambert, John Lewis, Kathleen Louw, Susan Middleton, Dorothé Mizéhoun (Ayadokoun), Sabrina Motley, Constant Noanti, Francesca Piqué, Leslie Rainer, Stephen Rickerby, Dwayne Rude, Constant Samson, Sheri A. Saperstein, Marc Simon, Sophie Small, Edouard H. Tokotchi, Sara D. Tucker, Aurel Zeigler, Julian Zugazagoitia, and the staff of the Department of Cultural Heritage. Scholars: Alexis Adandé, Joseph Adandé, Giovanna Antongini, Nondichao Bachelou, Suzanne Preston Blier, Bellarmin Codo, Josette Rivallain, Claude Savary, Tito Spini, and Pierre Verger. Project Support: Charles Aguida, Michel Alladaye, Nestor Gnankadja, Lambert Hounsa, and Cyprien Tokoudagba and family.